MyĆshin-ji is a temple complex in Kyoto, Japan. The Myoshin-ji school of Rinzai Zen Buddhism is the largest school in Rinzai Zen. This particular school contains within it more than three thousand temples throughout Japan, along with ninteen monasteries. The head temple was founded in the year 1342 by the venerable Zen Master Kanzan-Egen Zenji (1277-1360). Nearly all of the buildings were destroyed in the Onin War in 1467, however, many of them have since been rebuilt. 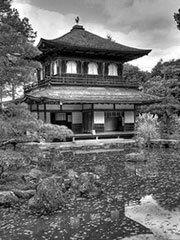 A notable difference between this and other schools of Rinzai Zen is that the Myoshin-ji school does not necessarily follow the set of established Koans for the sake of testing one’s stage of enlightenment. Rather the Myoshin-ji school allows the master to specifically tailor Koans to a student’s needs and background, though this method is occasionally met with a certain degree of hostility from the other schools in so far as it diverges from the traditionally accepted canon of Koans.